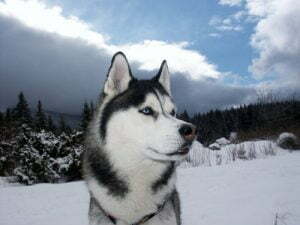 The Siberian Husky has a wolf-like appearance and shares some characteristics to other Spitz breeds, such as the Samoyed and the Alaskan Malamute. They feature an assortment of colours and markings, with the most common colours being gray and white, black and white or copper and white, though pure white dogs are not uncommon. The Siberian Husky usually has white leg and paws, and will feature striking facial markings such as masks or spectacles. 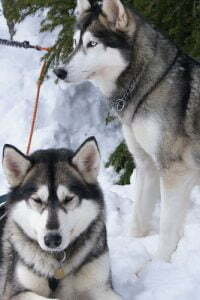 The nose colour of the Siberian Husky will depend upon the colour of the coat; in gray dogs it will be black, in copper dogs it will be liver coloured, it will be tan in black dogs and flesh coloured with pure white dogs. The Siberian Husky will sometimes exhibit ‘snow nose’, known as hypopigmentation (the loss of skin colour caused by decreasing melanin levels), but this is acceptable if you wish to show your dog. The coat of the Siberian Husky is thicker than most other dog breeds. It is made up of two layers; the undercoat is dense and heavy, whilst the topcoat is made of short guard hairs. As well as keeping the Husky warm during freezing Arctic winters, it reflects heat in the summer to help keep it cool. 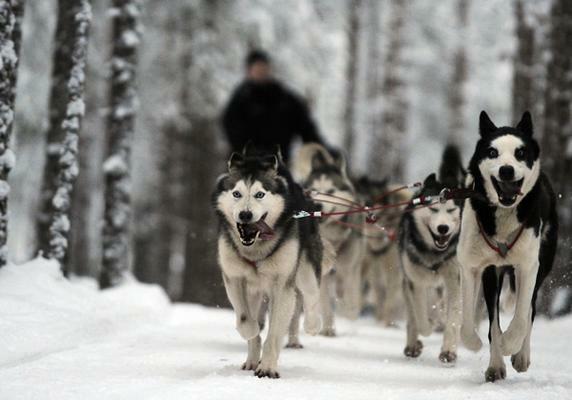 Amazingly, the Siberian Husky can withstand temperatures of -50 °C to -6o °C. Their coat should be brushed two times a week, with special attention required during shedding when the under coat is usually not present. Regular checks should be made of the teeth, and nails should be clipped regularly. You should bathe the dog only when needed. 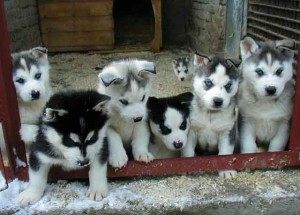 The Siberian Husky is a gentle, docile dog who is faithful to its family. They are excellent with children and love strangers, although the fact that they bark very little means that they do not make very good watchdogs. They love playtime, and are sometimes called “the clown of dogs” for their tendency to play like a puppy throughout their life. They are good with other pets they are raised with through puppyhood. The Siberian Husky is a pack dog, and requires strong leadership; if you do not display this, it can become mischievous and obstinate. It is of high intelligence, and as such can get bored easily. It is advisable to keep a Siberian Husky physically and mentally stimulated, as such boredom will lead to destructive behaviour. If you leave a Siberian Husky alone for any length of time without exercise, it has a tendency to howl. The intelligence of a Siberian Husky will allow it to shine during obedience trials, but it is a sled dog at heart and will therefore need patience and an insight into the dog’s character. An owner will need to ensure that the dog does not become bored, as it may cease to listen to commands. This can usually be avoided by varying training activities and ensuring that you are a firm and consistent pack leader. A Siberian Husky will sometimes mimic an owner’s actions, such as turning on lights or opening doors, but this can lead to undesirable behaviour such as opening the fridge door to get at food. 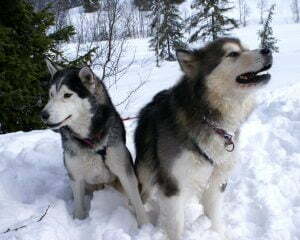 The breed can sometimes be difficult to housebreak, and care must be taken when letting a Siberian Husky off the lead, as it has a tendency to run off. 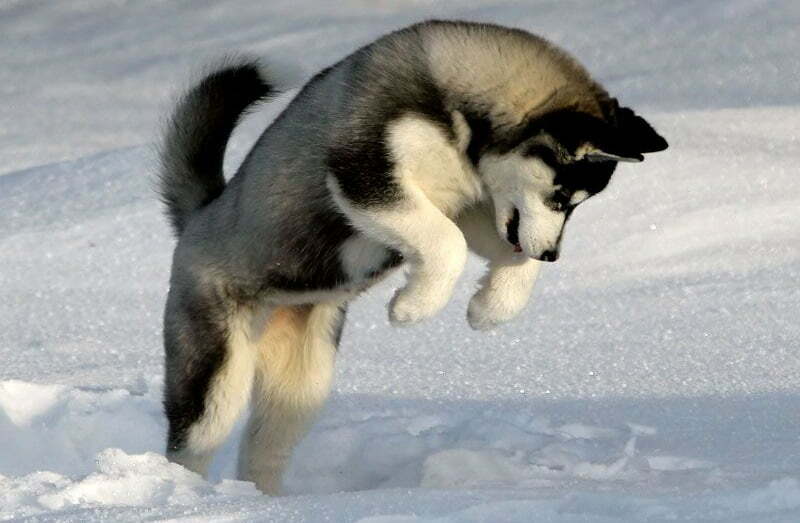 The Siberian Husky has a low instance of hip dysplasia – roughly 2 per cent of the breed will experience it. More common are genetic defects such as eye defects, seizures and gastric conditions. The name ‘Husky’ is derived from the term “Eskie” – a name given to the Inuit people by the first Europeans who travelled to the Arctic. The Siberian Husky descended from the original Eskimo sled dogs, and DNA analysis has revealed it is one of the oldest breeds of dog in the world. The breed travelled with prospectors to Alaska during the 1908 gold rush, and were popular for their ability to survive on little food, their strength, speed and imperviousness to harsh winter climates. It came to dominate the All Alaska Sweepstakes, a 408 mile dog sled race from Nome to Candle and back. During the 1925 diphtheria epidemic in Nome, Alaska, the Siberian Husky was used to transport much needed medicine. In 1930, the American Kennel Club recognized the Siberian Husky, and it was registered in Canada nine years later. In 1933, Rear Admiral Richard E Byrd used the dogs during his Antarctic expeditions. Togo and Balto were part of the Siberian Husky team that delivered diphtheria medicine to Nome. Diefenbaker was RCMP Constable Benton Fraser’s faithful companion in the TV series Due South, and Jed played The Thing in the 1983 John Carpenter film of the same name. That is one of the best looking dogs I’ve seen – but sadly a little impractical for someone living in a small house. Maybe if I own my own ski lodge somewhere one day!